Have you ever thought about how a size 1 soccer ball could give you the same soccer education as some of the greatest players of all time? Well, today we look at some of the best size 1 soccer ball drills that will help you achieve that goal! Some of the world’s greatest ever soccer players share a lot of things in common. For instance, many of them grew up in poverty in different places in the world and soccer was their ticket to the big time. The likes of Diego Maradona and George Best didn't grow up with the greatest facilities to play soccer. Instead they developed their skills as young players by using whatever they could find to use as a soccer ball. George Best said that he was able to develop his incredible skills by kicking a tennis ball with his schoolmates. He credits the years and years he spent using a tennis ball as the way he was able to sharpen his quick feet and unbelievable ball skills that made him one of the greatest players of all time. It is one of the enduring appeals of soccer and what makes it truly the World’s game is that just about anybody can play with anything. These days with soccer balls so cheap and easily supplied the days of kicking an old tin can up and down the streets with your buddies have largely gone and some would argue that the opportunity to develop those Street soccer skills has gone. One way to easily substitute this soccer education from the streets is to use a size 1 soccer ball. A size 1 soccer ball is often called a skills ball because of the way it develops your touch and skill as a soccer player. When you begin you will notice how much more difficult it is to juggle the size 1 soccer ball than it is a normal sized soccer ball. You must really concentrate to ensure you are looking after the ball and bring it to the right height to enable you to keep juggling. One of the great advantages of using a size 1 soccer ball is that you only need a very small area in which to practice with it. In fact you can even begin to develop your own training schedule without leaving the house by using your size 1 soccer ball. You simply need to create a little room for yourself in the center of a room and remove all the breakable objects then you can develop your skills gently in the comfort of your own home! An important point to remember is that the size 1 soccer balls will not only sharpen up your ball skills with your feet but can also be a fantastic training tool for goalkeepers. 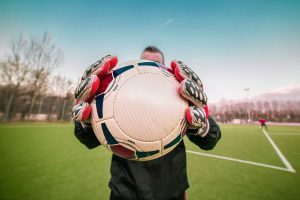 Several of the top keepers in football will do at least one session a week with a size 1 soccer ball to improve their reflexes and shot stopping. ​The top goal keepers in the world use their feet to side step into position to be able to save the ball and practicing with a size 1 soccer ball helps make them more agile. It also improves their hand / eye co-ordination and trains their eyes to watch the ball more closely because it is essential to do this to save a size 1 soccer ball. By focusing on watching the ball closely and using your feet to get into good positions to save the ball it can really help to improve you as a goalkeeper. Watch this goalkeepers training session which is full of warm-up and ideas of drills to help improve your goalkeeping skills using a size 1 soccer ball. ​The great thing about using a size 1 soccer ball is that it opens up so many more opportunities for practicing by yourself. You do not need a full squad or team of players in order to be able to take part in a session to improve your skills. In Summary, try your best to get hold of a size 1 soccer ball and use it regularly to improve your skills. Size 1 Soccer Balls are great for developing your skills, so why not check out the best selling balls over on Amazon. Do you train with a Size One Soccer Ball? What drills do you use with a Size 1 ball? Has your game improved by using a Size 1 Soccer Ball?